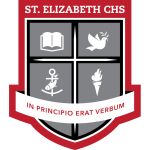 Our school is named after St. Elizabeth, the cousin of Mary, and mother of St. John the Baptist. At an elderly age, Elizabeth was told that she was to bear a child. Months later, she welcomed her pregnant cousin Mary. This welcome is crucial to understand the importance of Elizabeth. Elizabeth practiced the ministry of hospitality. Mary could have been dismissed as a pregnant teen that was causing scandal. But Elizabeth not only welcomed her but also ran out to meet her saying, “You are most blessed of all women, and blessed is the child that you will bear”. She saw the sacred in Mary. At St. Elizabeth CHS, we continue St. Elizabeth ministry of hospitality in so many different ways. We practice hospitality to new members of our community no matter who they are. We practice intellectual hospitality in welcoming new ideas, skills, and acts of creativity. We practice moral hospitality by reaching out to those within and outside our community with acts of justice and charity. We practice sacred hospitality through our prayers and worship where we welcome and celebrate God’s presence among us. St. Elizabeth gave birth to St. John the baptist who announced the coming of the messiah. We announce the presence of the sacred through our acts of hospitality.